I took this picture with an iPhone 4s last year, on Valentine’s Day at nighttime. My husband was on a business trip and he surprised me with a call at lunch wondering if I could get to the airport for an early evening flight that would put me in Jacksonville for a romantic late dinner. I took this on our stroll. Blue happens to be our favorite color. I love the color orange, but I never turn down blue. Ha! That’s fair. Me, neither! We live in Vero Beach now, but used to drive back and forth from Massachusetts once a year for vacations for many, many years. 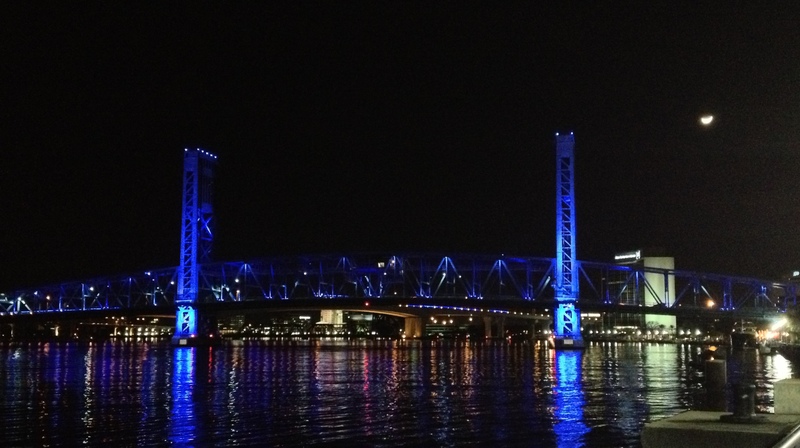 It always seemed we passed through Jacksonville around 10pm and the bridge was a favorite sight around that time! Sweet that you recognize it! Lovely night lights, my fav colour is blue as well. Some blues which were a great substitute for the ones you would have had home alone! Oh, I love how you put that! Thanks! What a beautiful, romantic night! Really romantic. Thanks for following me. Welcome to my blog. H.
Thank you! I look forward to more from you. What a beautiful shot. I like the blue too. Beautiful. Thank you so much for following my blog! 29 yrs….wow may your love stay fresh like this forever. Surprising mobile photo at night. They are ok at day but yours ist great!